What Do You Want To Know About Candle Making? These candles are made from canes of bamboo with a candle at one end that is formed by the dipping method. Take a cane of bamboo and wrap 15-20 cm of one end in brown parcel paper. Do this by taking a 5cm wide strip of paper about 50 cm long. Apply wax glue to one side and wind the paper diagonally along the end of the cane to cover it. Tuck the overhanging end of the paper into the tip of the cane. Melt and colour paraffin wax in a dipping container. When the wax is about 70 degrees C (160 F) begin dipping the paper covered end of the cane into the wax. Each dip will last for about 3 seconds, leaving 1 minute intervals between dips. Keep dipping until the wax is about 2.5 cm (1 inch) thick. Add more wax to your dipping pot as necessary. Be sure to keep the wax at about 70 degrees for dipping. Take a thick wick and prime it in the melted wax. Leave it to cool, then wind it diagonally around the wax coated end of the cane. Leave some wick overhanging at the top, and secure the wick at both ends with wax glue. Begin dipping again until the wick is covered and the candle looks relatively smooth. Before the candle hardens completely, trim away the wax from the wick overhang at the top, so you can light it properly later. 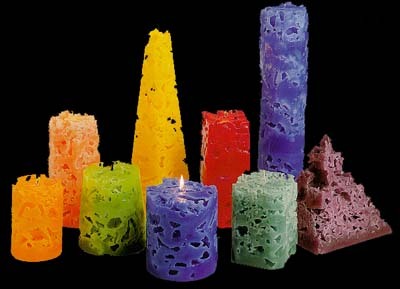 These candles consist of stacks of geometric shaped wax slabs of about 1-2 cm thick. Prime a wick with melted wax for later. Pour coloured melted wax into a metal baking pan, to a thickness up to 2 cm. Before the wax hardens completely, cut out your shapes, using a cardboard template as a guide. You can use all one shape, such as squares or triangles or a combination of shapes. Make a wick hole in the centre of each shape and leave to cool and harden completely. Lift each cut out shape out of the pan. Take your primed wick and attach a wick holder to one end. Take each shape and thread it onto the wick arranging each shape at a slightly different angle for effect. You can make alternate coloured layers, or try using a cookie cutter for even more varied shapes. A. If the mould is small, just put it in the freezer and pour the wax right away after removal from the freezer. B. Pack the mould in ice. C. Pack the mould in dry ice. Melt some paraffin in a container in a pan of water on the stove or hot plate. Colour it with a contrasting or complimenting colour to the original taper colour. Heat water to almost boiling in a tall container. Pour to float the coloured paraffin on the surface of the hot water in the tall container. Swirl the coloured paraffin around gently. Dip your taper candle in the water/coloured paraffin vat, swirling it around as you pull it out. It will develop a mottled, swirl pattern of colour on its surface. Let it harden and cool. Repeat if you desire. Hope my suggestion comes in handy!! These paper coated wax parcels will help start wood fires. They are made from paraffin, poured into egg cartons and hardened by cooling. You can mix sawdust shavings with the melted wax before it hardens, to improve its fire lighting properties. 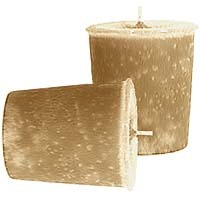 Only use these in a fireplace, they are not candles and are not designed to burn in a safe manner.